Officers from the East Tynedale Neighbourhood Policing Team have been out and about running a number of street engagement days. The engagement days coincide with organised community events in the area. The events give residents the chance to meet local officers face-to-face and discuss any concerns they have. It also allows police to give crime prevention advice and tell them about what's going on where they live. 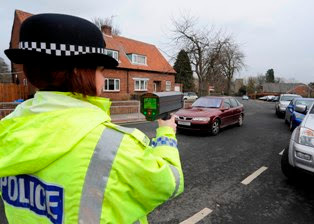 One such event, held in Ponteland last week, saw officers out on the streets tackling the local issues of speeding in and around the major roads in Ponteland, bogus callers in the Darras Hall estate and scrap vehicles in the area. Static speed check points were set up in key areas and officers were deployed with speed guns to monitor and deter speeding vehicles in the village. Police and community wardens visited local addresses that had been identified as potentially vulnerable to bogus callers, chatted to homeowners and gave away crime prevention packs. Officers also stopped and checked work vans and scrap vehicles to ensure only legitimate workmen were active on the estate. East Tynedale Neighbourhood Inspector Kevin Oates said: "The Ponteland day of action was a great success. Officers spoke to lots of people from the area who were happy to see officers out on the streets and doing something about the issues that concern them. "We plan to continue these engagement events and roll them out throughout Tynedale over the next couple of months."